When 51-year-old John Stravalle of Newburgh, NY headed out to go fishing on an early evening in January in Lackawaxen, PA, he never thought he’d find himself fighting for his life in 33-degree water. After attempting to retrieve his anchor he fell overboard from his canoe, and began the difficult task of swimming to shore in the frigid Delaware River. Once on shore, he was helped by a local homeowner. Thankfully, Stravalle was wearing his life jacket and was able to make that difficult swim. While a hunter or angler may not think of themselves as a boater, any time you’re on the water, a life jacket should be part of your essential gear and worn at all times. 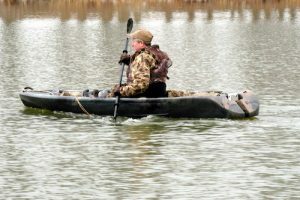 Often a hunter or angler will set out on their trip alone, and neglect to wear a life jacket or file a float plan with the details of their trip. A person who falls into the water experiences increased danger with water temperature that is below normal body temperature (98.6 degrees F). You have one minute to adjust to the cold shock of being in the water, 10 minutes of meaningful movement to get help and get out of the water, and one hour before he/she becomes unconscious from hypothermia. Here are some tips to keep in mind before you go cold weather boating this winter and early spring. Do make sure everyone is wearing a life jacket. Even experienced swimmers can experience shock within one minute in the frigid water and may lose muscle control within 10 minutes. Do file a float plan with someone you trust that includes details about the trip, boat, passengers, towing or trailer vehicle, communication equipment, and emergency contacts. Download a free float plan template at FloatPlanCentral.org. Do dress properly for the weather, always wearing layers, and bring an extra set of clothes in case you get wet. Remember, dress for the water temperature, not the air temperature. Do catch your breath. A sudden unexpected fall into cold water causes an involuntary gasp (or torso) reflex. It takes less than ½ cup of water in your lungs to drown. If you remain calm, you have a greater chance of self-rescue. Do look for ways to increase your buoyancy. If you’re in the water with others, huddle together with everyone facing inwards to help everyone stay afloat and keep warm. Don’t panic if you fall into the water. Stay afloat with the help of your life jacket, regain control of your breathing, and keep your head above water in vision of rescuers. Stay with the boat if possible. Don’t apply heat to extremities like arms and legs of a rescued victim. This sudden change in temperature may cause cardiac arrest. Recreational water activities during the cold months are a lot of fun, but always remember safety first. And, like John Stravalle, you never know when wearing your life jacket will save your life.